One in four older Americans who use prescribed benzodiazepine drugs such as Xanax (generic alprazolam) for sleep issues, anxiety and depression end up becoming addicted, according to a recent study. The study, published 10 September 2018 in JAMA Internal Medicine, found that for every 10 additional days of prescribed drugs, the patient’s risk for long-term usage nearly doubled over the next year. This abusive assault on the elderly is the result of psychiatry maneuvering itself into an authoritative position over aged care. From there, psychiatry has broadly perpetrated the tragic but lucrative hoax that aging is a mental disorder requiring extensive and expensive psychiatric services. Long-term benzodiazepine users are more likely to develop anxiety or have sleep problems, the very things the drug was supposed to treat. The FDA recommends reporting adverse psychiatric drug reactions to the MedWatch program. It could be dangerous to immediately cease taking psychiatric drugs because of potential significant withdrawal side effects. No one should stop taking any psychiatric drug without the advice and assistance of a competent medical doctor. The exact mechanism of action of benzodiazepines is not known, but they play Russian Roulette with neurotransmitters in the brain. Daily use of benzodiazepines has always been associated with physical dependence. Addiction can occur after just 14 days of regular use. Withdrawal and addiction to benzodiazepines can be as traumatic as with heroin. The typical consequences of withdrawal are anxiety, depression, sweating, cramps, nausea, psychotic reactions and seizures. There is also a “rebound effect” where the individual experiences even worse symptoms than they started with as a result of this chemical dependency. Xanax is particularly obnoxious. After a patient stops taking Xanax, it takes the brain six to eighteen months to recover. Extreme anger, hostile behavior, violence and suicide are potential side effects. Then, once they are addicted and try to withdraw from the drug, they can be diagnosed with a fraudulent mental illness called “Sedative, hypnotic, or anxiolytic withdrawal” and prescribed additional psychiatric drugs for the withdrawal symptoms. The real problem is that psychiatrists fraudulently diagnose life’s problems as an “illness”, and stigmatize unwanted behavior as “diseases.” Psychiatry’s stigmatizing labels, programs and treatments are harmful junk science; their diagnoses of “mental disorders” are a hoax – unscientific, fraudulent and harmful. CCHR recommends that everyone watch the video documentary “Making A Killing – The Untold Story of Psychotropic Drugging“. Containing more than 175 interviews with lawyers, mental health experts, the families of psychiatric abuse victims and the survivors themselves, this riveting documentary rips the mask off psychotropic drugging and exposes a brutal but well-entrenched money-making machine. The facts are hard to believe, but fatal to ignore. Watch the video online here. The January 18-24 2019 edition of the St. Louis Business Journal extolled the virtues of making lots of money from medical marijuana. Yes, we know that medical marijuana is now legal in Missouri; and yes, we know that the Business Journal‘s interest in local businesses motivates its attention. On the other hand, a convincing argument can be made that, while legal and profitable, promoting marijuana is decidedly unethical. There are countless arguments for “medical benefits”; but those arguments seem to take second place after the arguments for how much money can be made. There are also arguments for medical harm. Let’s take a look at the medical disadvantages, to get a sense of how promoting marijuana could be unethical. Make no mistake, marijuana (often called cannabis in an attempt to avoid the negative connotations of weed) is a drug. Regardless of the name, this drug is a hallucinogen — a substance which distorts how the mind perceives the world. THC (tetrahydrocannabinol), the principal psychoactive component of marijuana, stays in the body for weeks, possibly months, depending on the length and intensity of usage. THC damages the immune system. In 2005, 242,200 emergency room visits in the U.S. involved marijuana. Nationwide, 40% of adult males tested positive for marijuana at the time of their arrest for a crime. Multiple studies have linked years of heavy marijuana use to brain abnormalities and psychosis. Cannabis is one of the few drugs which causes abnormal cell division which leads to severe hereditary defects. Because a tolerance builds up, marijuana can lead users to consume stronger drugs to achieve the same effects. People take drugs to get rid of unwanted situations or feelings. The drug masks the problem for a time, but when the “high” fades, the problem, unwanted condition or situation returns more intensely than before. Marijuana can harm a person’s memory — and this impact can last for days or weeks. Marijuana smoke also has all of the detrimental effects previously attributed to tobacco. The use of marijuana is not only harmful to the person himself; he can also become a risk to society. Research clearly shows that marijuana has the potential to seriously diminish attention, memory, and learning. Users have more accidents, more injuries, and absenteeism than non-users. Some will tell you that CBD (cannabidiol) is harmless because it does not contain THC. However, note that CBD and THC are structural isomers, which means they share the same chemical composition but their atomic arrangements differ. The proponents of CBD ignore the fact that it messes with the neurotransmitter serotonin when making claims for its safety and usefulness. There are very little long-term safety data available, but there is a lot of money riding on making this legal and ubiquitous; any bad effects are not going to be advertised or promoted. At higher dosages, CBD will deactivate cytochrome P450 enzymes, making it harder to metabolize certain drugs and toxins, particularly psychiatric drugs, leading to a toxic build-up of drugs and their subsequent adverse side effects. Drugs are essentially poisons. The amount taken determines the effect. A small amount acts as a stimulant. A greater amount acts as a sedative. An even larger amount poisons and can kill. This is true of any drug. Drugs block off all sensations, the desirable ones along with the unwanted ones. While providing short-term help in the relief of pain, they also wipe out ability and alertness and muddy one’s thinking. Drugs affect the mind and destroy creativity. Drug residues lodge in the fatty tissues of the body and stay there, continuing to adversely affect the individual long after the effect of the drug has apparently worn off. In 2013 the American Psychiatric Association said, “There is no current scientific evidence that marijuana is in any way beneficial for the treatment of any psychiatric disorder.” The research was starting to show significant harm from cannabis use. However, the psychiatric industry today has jumped on the cannabis bandwagon for several reasons. Psychiatrists are embracing all things marijuana because they are getting so many patients with marijuana-related problems such as addiction and psychosis. Marijuana addiction is such a significant problem that there are 31 entries in the Diagnostic and Statistical Manual of Mental Disorders (DSM-5) related to this addiction. Unfortunately, the last thing any psychiatric treatment has achieved is rehabilitation from addiction. To the psychiatric industry, when they are not prescribing it as a “treatment”, cannabis use merely represents another pool of potential patients for other coercive and harmful treatments. The history of psychiatry makes it clear that over many, many years they have been pushing dangerous drugs as “medicines.” We didn’t originally know about the long-term destructive effects of LSD, heroin, ecstasy, benzodiazepines, ritalin, and so on when psychiatrists first pushed them onto an unsuspecting society. Cannabis is no exception, as more and more psychiatrists are prescribing “medical” cannabis in spite of (or because of) the addiction problem. We think it’s the latter; the pool of potential psychiatric patients is increased by increasing cannabis use. Ethics consists simply of the actions an individual takes on himself. A high level of ethics enhances one’s survival across all areas of life; it embodies rationality towards the greatest good for the greatest number. A low level of ethics, on the other hand, would be one’s irrationality toward bringing minimal survival, maximum harm or destruction, across all areas of life — or the least good for the fewest. An individual whose actions are harmful in society becomes subject to Justice. We leave it to each individual to observe for themselves the degree to which they and their associates are surviving well or poorly, and how marijuana may contribute to or obstruct the quality of their life. There are alternatives. We urge everyone embarking on some course of treatment to do their due diligence and undertake full informed consent. This effort targets young children by integrating the efforts of physicians, nurse practitioners, behavioral health clinicians, community health workers, home visitors, and other health care providers to funnel children into the mental health care system. The Child Psychiatry Access Project in Missouri provides child psychiatry phone consultation to primary care providers in several counties, with a goal of providing these services statewide by October 2020. Participating agencies are: University of Missouri School of Medicine, Behavioral Health Network, Assessment Resource Center, Behavioral Health Response, Washington University Pediatric and Adolescent Ambulatory Research Consortium, and the National Alliance for Mental Illness. Why Do We Think This Is Bad? They assert that up to 25% of children need this behavioral health care, which is patently false. Health care providers do not require informed consent from the family to call and discuss a case with these behavioral health consultants. The trouble is that psychiatric propaganda on the subject of children has thoroughly duped well-meaning parents, teachers and politicians alike, that “normal” childhood behavior is no longer normal; that it is a mental illness. And further, that only by continuous, heavy drugging from a very early age, can the “afflicted” child possibly make it through life’s worst. Contrary to psychiatric opinion, children are not “experimental animals,” they are human beings who have every right to expect protection, care, love and the chance to reach their full potential in life. They will only be denied this from within the verbal and chemical straitjackets that are psychiatry’s labels and drugs. Through massive promotion and marketing campaigns, psychiatric drugs are increasingly prescribed as the panacea for life’s inevitable crises and challenges. 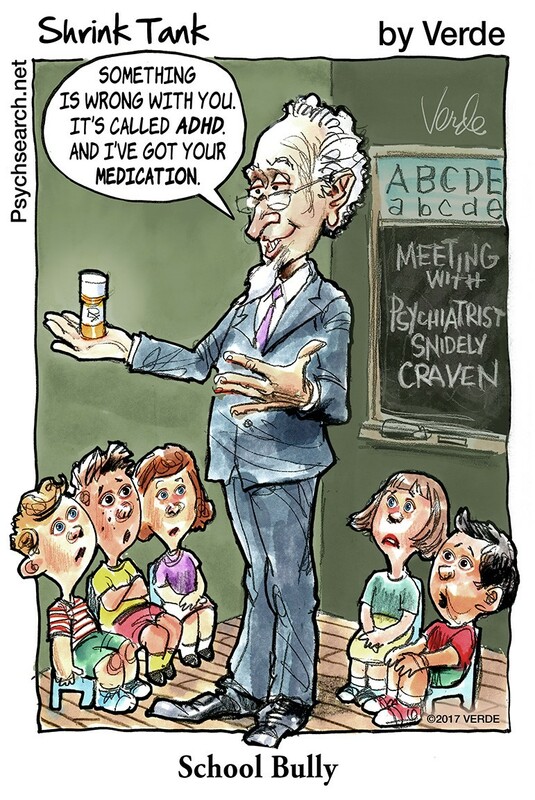 17 million schoolchildren worldwide have now been diagnosed with so-called mental disorders and prescribed cocaine-like stimulants and powerful antidepressants as treatments. Teen suicides have tripled since 1960 in the United States. Today, suicide is the second leading cause of death (after car accidents) for 15 to 24 year-olds. Since the early 1990s, millions of children around the world have taken prescribed antidepressants that U.K. and U.S. authorities have now branded as suicidal agents. In September 2004, a U.S. Congressional hearing into these drugs found that not only do studies show the drugs are ineffective in children; they can drive them to suicidal behavior and hostility. Psychiatrists are still telling governments that they can deliver the world from delinquency – at a huge cost. Psychiatry remains long on promise and short – in fact empty – on delivery. Support legislative measures that will protect children from psychiatric interference. Write your legislators about this. In Missouri find your legislators here. “Mental health advocates are lobbying Congress to help them get schizophrenia classified as a brain disease like Parkinson’s or Alzheimers, instead of as a mental illness, a move that could reduce stigma and lead to more dollars for a cure.” This according to a January, 2019 article on Politico.com. More and more health officials, scientists and doctors are recognizing that so-called “mental illnesses” such as schizophrenia and bipolar disorder are poorly understood and are really physical, medical issues — not some nebulous mental thing for which harmful and addictive psychotropic drugs are prescribed. There are no clinical tests for these “mental” diagnoses. But there are clinical tests for whatever turns out to be the real medical issue. So why are psychiatrists handing out so many harmful drugs without performing blood or other well-known clinical tests? Could it be because it is profitable, and insurance will pay for them? Any medical doctor who takes the time to conduct a thorough physical examination of someone exhibiting signs of what a psychiatrist calls schizophrenia can find undiagnosed, untreated physical conditions. Any person labeled with so-called schizophrenia needs to receive a thorough physical examination by a competent medical—not psychiatric—doctor to first determine what underlying physical condition is causing the manifestation. Any person falsely diagnosed as mentally disordered which results in treatment that harms them should file a complaint with CCHR, the police, and professional licensing bodies and have this investigated. They should seek legal advice about filing a civil suit against any offending psychiatrist and his or her hospital, associations and teaching institutions seeking compensation. In Missouri, file a complaint with the Board of Registration for the Healing Arts. 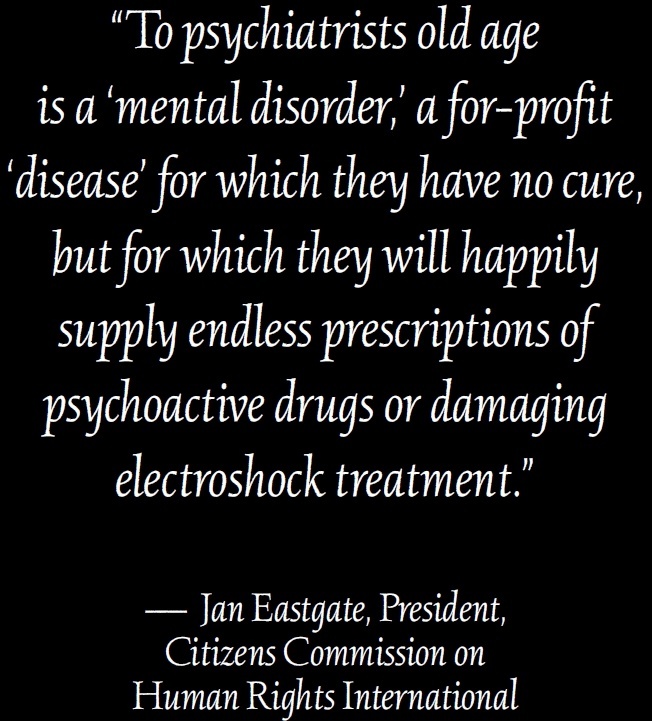 For more information, click here to download and read the full CCHR report “Schizophrenia—Psychiatry’s For Profit ‘Disease’“. Speak roughly to your little dog. And beat him when he seizes. Imepitoin, sold under the brand name Pexion from Boehringer Ingelheim Vetmedica Inc. of St. Joseph, Missouri, is an anticonvulsant used in veterinary medicine to treat epilepsy in dogs. It was originally developed to treat epilepsy in humans, but clinical trials were terminated upon findings of unfavorable metabolic differences between smokers and non-smokers. Anticonvulsants are also increasingly being used in the treatment of so-called bipolar disorder and borderline personality disorder, since many seem to act as mood stabilizers. Pexion is similar to Valium and other benzodiazepines (anti-anxiety drugs or minor tranquilizers), acting as a low affinity partial agonist of the benzodiazepine receptor, which means that it acts in the brain similar to a benzodiazepine. It is very unusual for any dog with epilepsy to become completely seizure free even after they have begun taking this drug. The theory is that the drug suppresses electrical activity in the brain. On December 4, 2018, the U.S. FDA approved Pexion to treat anxiety in dogs freaked out by noises. In other words, it’s a tranquilizer for dogs. Dog owners are cautioned to carefully monitor its use, since a side effect can be a change in the dog’s level of aggression. Well guess what, a side effect of these kinds of drugs in humans is also aggressive behavior. Some tranquilizer! The FDA urges pet owners and veterinarians to report side effects. 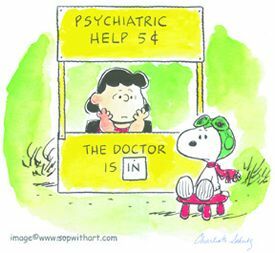 It used to be only psychiatrists who prescribed tranquilizers; then family doctors became common prescribers; and now veterinarians have entered the psychiatric industry, ready to psychoanalyze your dog and prescribe a tranq. Daily use of benzodiazepines in humans is associated with physical dependence. The withdrawal from drugs like these is more prolonged and often more difficult than withdrawal from heroin. Although dogs have not so far shown addiction to Pexion, physical dependence is a known side effect of other antiepileptic drugs in dogs. The point we want to make is that the psychiatric industry makes a concerted effort to create new patient classes for their coercive and abusive treatments, and in this case that includes pets. We wrote about Prozac for pets way back in 2011, so this trend is continuing. A primary care physician or family practitioner who refuses to prescribe a psychiatric drug can be accused of being unethical, or even charged and jailed for “criminal medical negligence” because they are not applying the current “standard of care.” Soon your veterinarian may find themselves criminally liable for not prescribing tranquilizers for your pet. TruthAboutECT.org is a blog site created to bring about public awareness of the dangers of electroconvulsive therapy (also known as electroshock or ECT). 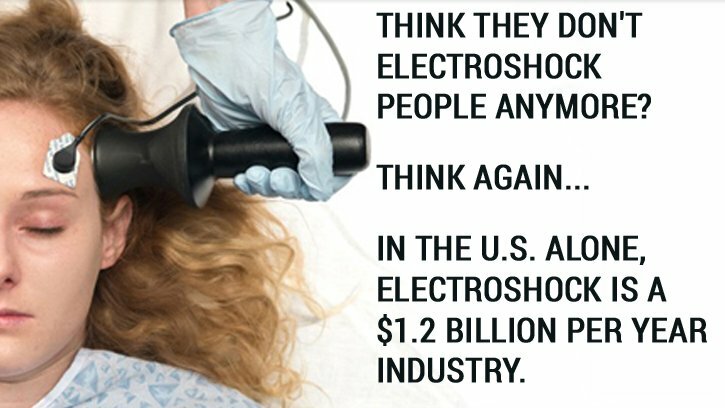 Most people don’t believe that electroshock is still being used in modern society. This is most likely because the mere idea of electroshock is so abhorrent that most people simply can’t believe it’s still being used. Factually, ECT is one of the most brutal “treatments” ever inflicted upon individuals under the guise of mental health care. Yet approximately one million people worldwide, including an estimated 100,000 Americans, are given electroshock each year, including the elderly, pregnant women and children. The Washington University in St. Louis psychiatrists at Barnes-Jewish Hospital give 2,000 shock treatments per year, including to pregnant women. The articles on this website are written by those who have either experienced the damaging effects of ECT or those who are medical professionals who have seen the damage caused by it. On December 3, 2018, the Inter-American Commission on Human Rights of The Organization of American States published a Precautionary Measure calling for the Judge Rotenberg Educational Center in Canton, Massachusetts to immediately cease electroshocking children as a disciplinary measure, emphasizing that electroshock is a gross violation of human rights. A November, 2018 Supreme Court decision in Victoria, Australia ruled that the forcible use of electroshock treatment violates patients’ human rights, saying “People with mental illness are highly vulnerable to interference with the exercise of their human rights, especially their right to self-determination, to be free of non-consensual medical treatment and to personal inviolability.” While the decision reinforces that electroshock given without consent is a human rights violation, the entire practice of ECT is a human rights violation and should be banned. If you would like to report a psychiatric abuse, please fill out the abuse reporting form by clicking here. If you would like to write about your own horrifying electroshock experience, click here. For more information about the devastating effects of ECT, click here. 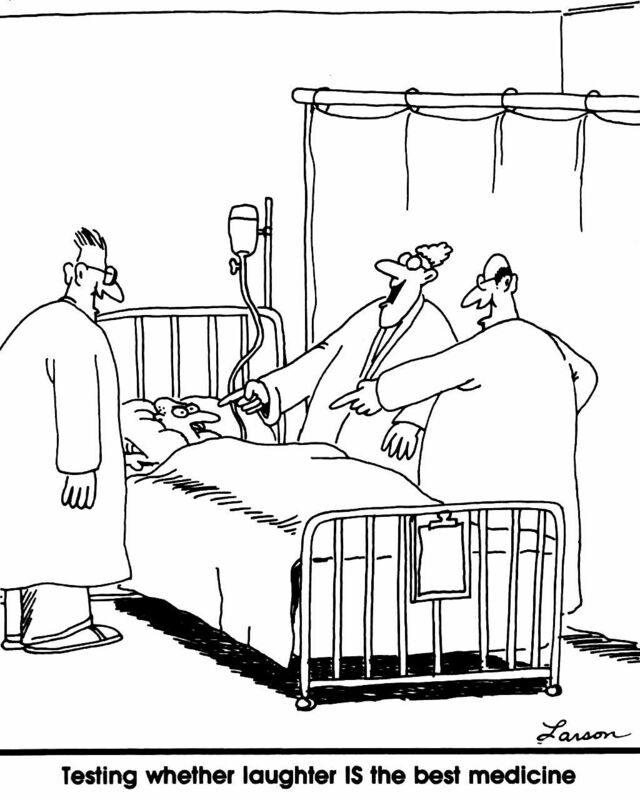 The earliest known psychotherapy consisted of getting a patient to laugh. Laughter includes both surprise and rejection. We’re sure you can think of an example; here’s a start — think of a cartoon or a joke that made you laugh. Now observe the surprising part of it, and observe the idea or concept being rejected. The surprise seems to be the unexpectedness of the second opinion; it wasn’t predicted. Apparently one also seems to reject the idea that a psychiatrist would actually say something like that when he was being asked for help. An individual who is too serious has lost his ability to predict, and cannot be surprised into rejection. When one rehabilitates the ability to laugh, just by laughing for no reason, it benefits the person immensely. We recently have seen many examples of people being too serious and unable to laugh. There are Facebook pages devoted to various jokes and cartoons. One such page requires participants to actively ask for admission, so you know they are viewing and posting on that page on purpose. Then, they make comments on the various jokes and cartoons about how it isn’t funny, or how it is offensive, or how much they dislike it. They have essentially lost their laughter, and are going through life serious as a stone. A person who is unable to laugh will be strictly literal, unable to tolerate confusion, and unable to appreciate remarks made in fun. Some psychologists and psychiatrists have learned to respect the value of laughter; as the joke goes, how many psychologists does it take to change a light bulb? Just one, but it has to want to change. Other psychologists and psychiatrists may mistake genuine laughter for ridicule, which is decidedly not the same thing. And some may consider it only as a stress coping strategy rather than the simpler explanation described above. There was a period in psych-influenced education which considered that if you’re laughing, you’re not learning. We actually knew a high school principal once who thought that children could not learn unless they were quiet and sitting down. The study of laughter is called gelotology, from the Greek word gelos meaning laughter. There is even a branch of yoga called Laughter Yoga, which incorporates breathing, yoga, and stretching techniques, along with laughter. There are at least fifteen English words and phrases describing various kinds of laughs. When neuropsychiatrists study laughter, of course they mean they are studying the brain; they get hung up in the physiology, brain waves, serotonin, hormones, and other mechanical aspects. They get all scientific on you, talking about “activation of the ventromedial prefontal cortex.” They seem to lose sight of the simplicity of the effect, so that they can patent it and manipulate it with some drug. You can’t charge someone’s insurance for a prescription for laughter. Well, what’s the bottom line? We think that psychiatry is a joke, but we’re not really laughing about it. Perhaps we should. Check out a few of our psych jokes here. Would you let a psychiatrist poke wires directly into your brain and turn on the current? Deep Brain Stimulation (DBS) is a process where electrical shocks are delivered directly into the brain by wires inserted into holes bored into the skull. In other words, some psychiatrists are now admitting that the chemical imbalance theory is bogus, and they are desperately trying to find other treatments, because too many people are now wise to the chemical imbalance fraud. In response to this alarming and abusive “therapy” the Citizens Commission of Human Rights calls for victims to report abuse suffered during this or any other psychiatric treatment. No one denies that people can have difficult problems in their lives, that at times they can be mentally unstable. Unfortunately, not only do psychiatrists not understand the etiology (cause) of any mental disorder, they cannot cure them. In effect, psychiatrists are still saying that mental problems are incurable and that the afflicted are condemned to lifelong suffering. Psychiatric treatments such as DBS, however, are unworkable and dangerous, and while they may temporarily mask some symptoms they do not treat, correct or cure any physical disease or condition; and by calling this a “treatment” they preclude finding out the real underlying causes of the condition and treating that with real, workable medical therapies. New high-tech “treatments” for the brain will continue to be used to create the appearance of scientific progress, but in the end, psychiatry will be no closer to identifying any causes or effecting any cures; instead, their betrayal and brutality in the name of mental health continues. Psychiatry has proven only one thing — without the protection of basic human rights, there can only be diminished mental health. Persons in desperate circumstances must be provided proper and effective medical care. The correct action on a seriously mentally disturbed person is a full, searching clinical examination by a competent medical, not psychiatric, doctor to discover and treat the true cause of the problem. Click here for more information about the brutal reality of abusive psychiatric practices such as electroshock, deep brain stimulation, and psychosurgery. CCHR STL wishes all its supporters a healthy, happy, prosperous life and extraordinary mental health; holidays and new years notwithstanding. Around holidays, the psychiatric industry typically promotes lots of media about holiday stress. We’ve written about stress previously; particularly about holiday stress. There are even scholarly research articles about it: “Urban legend suggests that psychopathology tends to increase around the holidays.” You don’t have to agree with this. Why are we still giving any credence to the fraudulent diagnosis of Attention Deficit Hyperactivity Disorder (ADHD)? 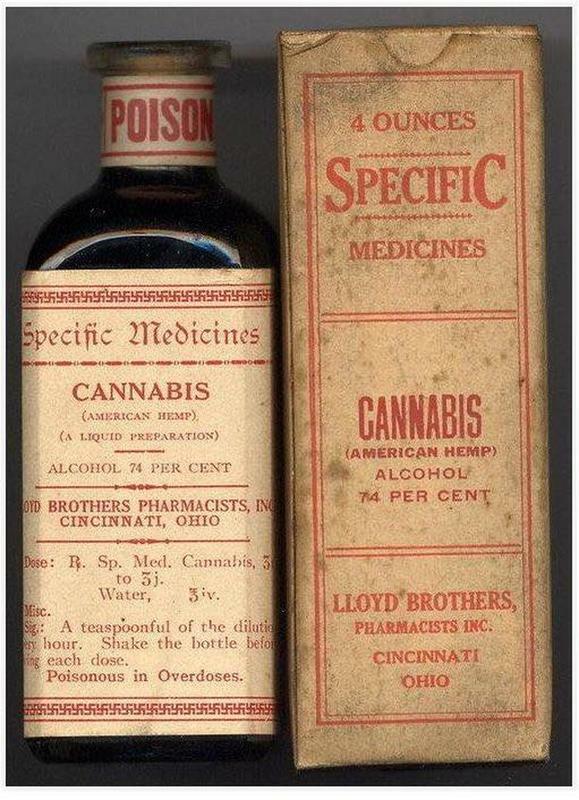 Because we’ve been bombarded since 1902 by public relations and marketing campaigns designed to provide psychiatrists, psychologists, and pharmaceutical companies with new patients and to sell drugs. In 1987, ADHD was literally voted into existence by a show of hands of American Psychiatric Association members and included in the Diagnostic and Statistical Manual of Mental Disorders (DSM-5). Within a year, 500,000 children in America alone were diagnosed with this, and to expand the client base it has also been associated with Asperger syndrome and Autism spectrum disorder. ADHD actually represents the spontaneous behaviors of normal children. When these behaviors become age-inappropriate, excessive or disruptive, the potential causes are limitless, including: boredom, poor teaching, inconsistent discipline at home, reading difficulty, tiredness, street drugs, nutritional deficiency, toxic overload, and many kinds of underlying physical illness. The British Psychological Society says that giving stimulant medication to children under 5 years old is antithetical to safeguarding them. Children who are suffering from bullying, abuse or stress may also display these behaviors in excess. By making an ADHD diagnosis, we ignore and stop looking for what is really going on with the child. These children need the adults in their lives to give them additional attention and to find and treat the actual causes. There is no valid ADHD test for children. There is no valid ADHD test for adults. ADHD in adults is just as bogus as ADHD in children. The ADHD diagnosis does not identify a genuine biological or psychological disorder. 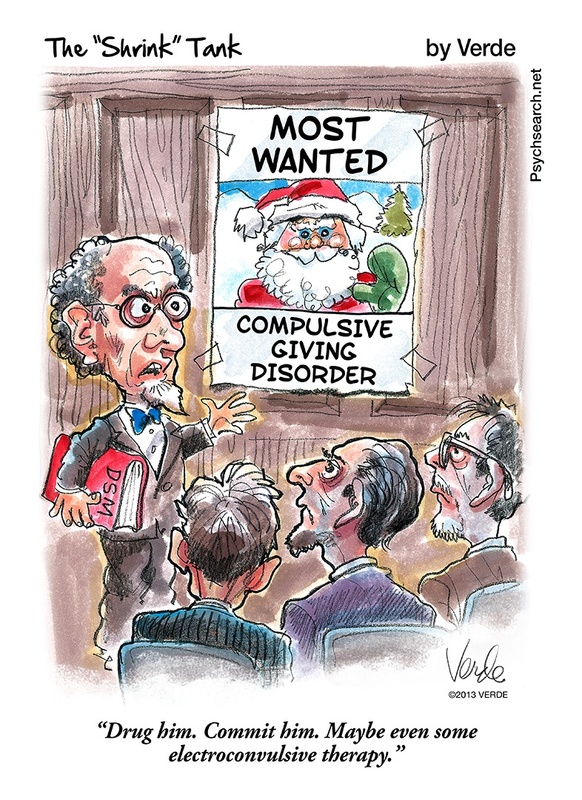 The diagnosis is simply a list of behaviors that may appear disruptive or inappropriate, or that a psychiatrist or psychologist has decided they do not like. No one denies that people can have difficult problems in their lives, that at times they can be mentally unstable, subject to unreasonable depression, anxiety or panic. Mental health care is therefore both valid and necessary. However, the emphasis must be on workable mental healing methods that improve and strengthen individuals and thereby society by restoring people to personal strength, ability, competence, confidence, stability, responsibility and spiritual well-being. Psychiatric drugs and psychiatric treatments are not workable. Any parent whose child has been falsely diagnosed as mentally disordered which results in treatment that harms the child should file a complaint with the police and professional licensing bodies and have this investigated. They should seek legal advice about filing a civil suit against any offending psychiatrist and his or her hospital, associations and teaching institutions seeking compensation. Download and read the free CCHR booklet “Child Drugging — Psychiatry Destroying Lives — Report and recommendations on fraudulent psychiatric diagnosis and the enforced drugging of youth” for more information.